July 4, 2018: Gently Mixed Up: Elephant Micah live performance and chat. Matt O'Connell and Joe O'Connell of Elephant Micah. Click on the photo for more pictures. Since the year 2000, Indiana-based Elephant Micah has been swirling traditional Appalachian-style folk slowly around with complementary atmospherics. Elephant Micah is mainly the work of Joseph O’Connell, crafting these languid, moody tunes. On "Genericana," the new album coming out in August, Joe uses the themes of genealogy, genre, generic brands (and perhaps a bottled genie), to point to a different theory of what binds our culture together. To help fans keep up with O'Connell's sporadic output, Elephant Micah offers a $5. annual subscription through Bandcamp. 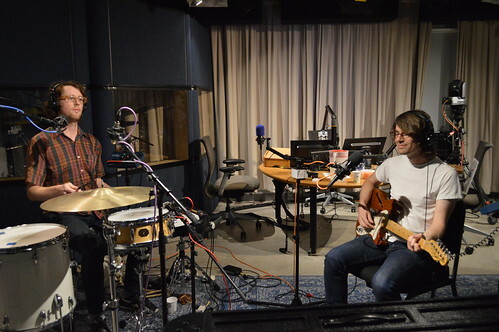 For this WFMU session Elephant Micah is Joe joined by brother Matt, recorded during a recent tour through the NY area. Big thanks to Bryn Scharenberg for engineering this session! Hi Irene. happy 4th all! Hi mb and dale! Happy 4th of July. Welcome treadstoner! Hope tonight's live music is to your liking. Glad you're all enjoying out this beautifully chilled out music. I love hearing how new generations are putting a new spin on more traditional music.